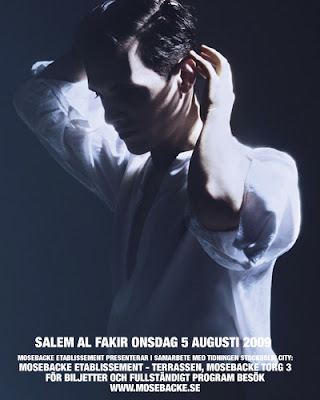 I found this advert for Salem's outdoor concert tomorrow at Mosebacke in Stockholm (courtesy of http://calistore.blogspot.com) and I just had to share it here! A bright sunny day is forecast, with a temperature of 22 degrees, which should be just perfect for everyone going to the show. If you are going, remember to post your comments here after the show. It was a fantastic concert! It was an absolutely fantastic evening. :) He played Brooklyn Sun with a new verse! And I got the setlist! I'm so happy that both Salem, the band and the audience enjoyed his homecoming show. Edvin - thanks for the setlist, what a great set :) And I'm glad to see that he's still playing "Brooklyn Sun" too.